Using color, form, and aesthetic balance, we can bring life to webpages, and provide content with ambience. From the client's ideas, I create appealing, varied graphics that invite the browser further into the Internet experience. Your ideas can easily be translated into web environments unique to your message. Environments that are flexible, evolving, and easily update-able. 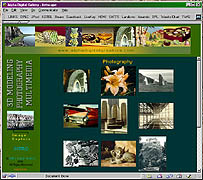 For a site with galleries, java, many pages, Flash movies, and extensive detail, like this, prices begin at about $750. Prices for smaller scale projects are below. Design, layout, and consultation fees are negotiable. Each project is different, so prices are scaled accordingly. The prices above are ballpark figures, for both window shoppers and potential clients. Pageformer defies the notion that an attractive, useful and well maintained website should cost a fortune. And if you just want a simple "Web Presence," Pageformer allows you to do so for the price of an order of business cards. Together we can create web pages, logos, and graphics that will get your ideas across to your clients in the most effective manner, and create a memorable, appealing Internet experience. Your own graphics, if that is your business, can become the perfect 'atmosphere' of your pages - elements of your work becoming elements of your web presence. Many of the sites I've done that are linked here were done this way - it is a virtual visit to the artist's studio. Often, people have printed material they have already been using to advertise or deliver a message, and this can be the foundation and guideline for the Internet version. If we start "from scratch," we sketch the website out on paper and build from there. It is extremely useful for me, the developer, if you can refer me to websites that you like, that you would like to use ideas from. On the other hand, I particularly enjoy translating pre-Internet graphics and design schemes to HTML. (Hyper Text Markup Language). There are usually one to one consultations at the beginning of the project, and then a good portion of the communication is done via email. I work on the site until you are happy with it for whatever arrangements we make, with additions subject to further planning. Please Note: Any logos or emblems that you want to use on the website should be "camera ready" - that is, sharp and clean printed items, or any graphic file [.tif,.jpg,.gif, etc.] Small imperfections will be glaring errors on the Internet, so the original material needs to be "perfect" by your standards. Prices for logo web-adaptation vary, with hourly billing. Your Internet Service Provider (the telephone number your computer dials to connect to the Internet, your ISP), depending on who they are, will allow you to post web pages on their servers, and "provide" for that. This means that we can create the pages offline, then "post" them on the servers, so that web browsers anywhere can look at those pages, "24/7," whether you are logged on or not. The information I need to begin production is the username, password, and FTP address. Your ISP probably included that information in whatever paperwork you have from them, in an email, or will provide it by telephone. It would look something like: "ftp.yourserver.com." With the address established, the web pages we develop are uploaded, and you can look at them wherever there is a computer with Internet access. You will be able to email me from anywhere, to provide feedback on how it looks. After the first 'blocking in,' a client might want the background lighter or darker, or want to change it completely, the arrangement of images and text needs changing, etc. This is all part of the process, and very rewarding when everything is fine tuned and looks the way the client likes it. An important precept to remember is that basic design decisions, such as backgrounds, color schemes, and navigational issues, are best settled early in the process. Once things are in place, development and additions to the website are simple and quick. You can email text changes or images and I will incorporate them. Photos, printed material, fabric, or even objects can be scanned, and used in the design of your website. When you are happy with the way it looks, we start propagating your address around the internet, and people can look at your pages, and communicate with you if you choose. The website's purpose is to present varied information and ideas, in a coherent and easy to use way. In many ways, the website mirrors a real world finding aid, such as a table of contents, sign board, marquee, or kiosk, and all these medium share a need for simple navigation. Organization of the site's content is critical at the onset of development. Categories of information, data, or image content should be clearly defined, and named. The most familiar navigation scheme consists of a short list of simple concepts, two words each at the most, that summarize particular classes of information. An example would be: "HOME / GALLERY / PRODUCTS / READING LIST / HISTORY." The entire content and import of the site should be clearly defined enough to summarize and jot on a pad of paper in a few strokes. This initial organization will provide the underlying structure of the site, its DNA, if you will, and the navigation scheme will follow suit. With the foundation in place, everything after that is almost infinitely flexible. With solid editing skills, I am able to take an array of printed or computer text files, in many cases from a variety of writers, and forge them into a cohesive whole, with continuity, a unified voice, Chicago Manual of Style adherence, and good spelling and grammar. Editing fees are hourly, and vary with each situation. Please Note: Your printed material and/or computer text files are taken as being exactly how the you want them to appear on the website. I will not edit the material without discussing it with you. Therefore, if there are mistakes in the original material, they will show up on the web. They can of course be corrected later, but it's better for everyone involved if the material is right the first time. Design elements of the site should be inobtrusive, and coherent throughout. The elements should be functional, and not gratuitous or redundant. It is better not to use too wide a palette of colors, and it is useful to use shades of color for subliminal navigation. Images and the entire design scheme should be pertinent to the topic, and can permeate the entire site. Virtually any possible esthetic or presence can be communicated through a website, so it is important to have a clear idea what kind of image you want to project. For ideas about basic design considerations in creating a website, tour this demo site.